How to Resolve MS Exchange Private (Priv1.edb) EDB File Error? What’s Inside the Exchange Server Architecture? Microsoft Exchange Server is the supreme email server platform deployed by many industries to enhance email services offered by MS Outlook client. The duo product of Microsoft unbelievably brings the delightful experience to its email users as they are more connected through emails, instant messaging, calendaring, task scheduler, etc. If we view Exchange Server from the server experts’ point of view, you will explore that the Exchange database is layered with extraordinary Extensible Storage Engine (ESE) facility and an intuitive information store where all email items along with log files resides. Focusing on the Exchange information store part, one can find versatile storage groups and several public mailbox folders inside the database. Despite this, one of the most crucial files that are generated during Exchange Server installation are Priv1.edb and Priv1.stm files. The Priv1.edb database file consists of rich email messages, heavy attachments, email headers, and non-SMTP email messages, whereas the Priv1.stm deals with Internet based graphics, videos, audio, and MIME data. When you are using the MS Outlook email services where Exchange Server stores almost all of your confidential email data in Priv1.edb files, then thinking of any Exchange Server destruction seems to be a nightmare for most of us. However, we must always be prepared for the worst case scenarios and backup all important email items in advance. Exchange Server is full of exquisite features; and the centralized repository for providing endless collaborative services. However, it should be noted that the regardless of extreme adaptive and rich interface at the Exchange Server client-end, the more fragile is the intrinsic ESE and information store. Any disparity in the page file reading, checksum value calculation, or normal shutdown process would results in plethora of Exchange Server errors and corruption like situation. Corruption at the file, jet engine, or information store levels would always impact the Priv1.edb files which comprises of way more than important email items. "Unable to initialize the MS Exchange Information Store Service"
"JET_errRecordNotFound, the key was not found", "JET_errRecordDeleted"
One should be aware of the Priv1.edb recovery plans along with the troubleshooting tactics to perform restoration of entire Exchange Server database without altering any Exchange Server resources. 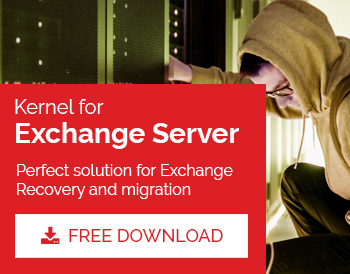 If you’re Exchange Server demands the recovery process, then you should involve ISINTEG and ESEUTIL facilities of Exchange Server in the server troubleshoot and restoration plans. Let’s get started with the information store or Priv1.edb revival process. It is recommended to perform the Exchange Server backup process to avoid any loss of email items. To perform Exchange database inspection and offline defragmentation procedure, go to Exchange System Manager and click Dismount Store. Before invoking the ESEUTIL tool to scan the database integrity and repair log files, set the system path from the Environment Variables to the following: \EXCHSRVR\BIN. Before proceeding with the offline defrag, check the Exchange Server Priv1.edb space dump with the following command in command prompt: eseutil /ms “c:\program files\exchsrvr\mdbdata\priv1.edb”. Initiate the integrity check of your Exchange Prvi1.edb database by entering the following command: ESEUTIL /g "c:\program files\exchsrvr\mdbdata\priv1.edb". At this stage, if you have no Exchange backup to reclaim all email items, then you need to perform the Exchange repair procedure. To repair Priv1.edb and Priv1.stm database files, input the following command: ESEUTIL /p "c:\program files\exchsrvr\mdbdata\priv1.edb" /Se:\exchsrvr\mdbdata\priv1.stm /Te:\tempdb.edb. Check the log files if they got repaired by the effect of the preceding command. After using the ESEUTIL tool to regenerate the ESE and information store, one should conclude the recovery process by invoking the ISINTEG tool and detect further errors. In the command prompt, enter the following command: isinteg –s dc –test folder and then check the accessibility of Priv1.edb files. I hope this solves the Priv1.edb corruption problems and will put the Exchange Server functionalities right on track. But, sometimes criticality of EDB corruptions fades away all the efforts made through an excellent and inbuilt ESEUTIL and ISINTEG tools. In such scenarios, reclaiming the Priv1.edb and Pub1.edb is the priority of any Exchange Admin. To counter the brutal EDB corruption scenarios, fielding an intelligent and result-driven third-party software is the suitable move. Kernel for Exchange Server is the technology-driven marvelous solution aimed to resolve industry standard Exchange Server errors. EDB to PST software stringently works with the versatile Exchange Server editions including the most recent MS Exchange Server 2016 and 2013. Furthermore, the dual scan modes of Exchange Recovery tool assure the full-fledge recovery of Private and Public EDB mailboxes while retaining the integrity of every data file.